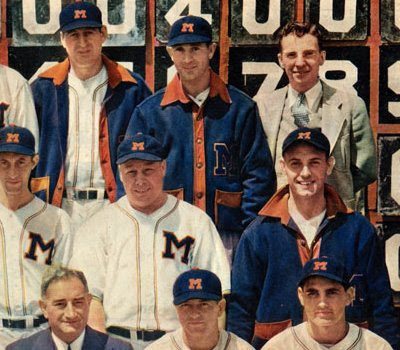 Throughout the past century, it hasn't exactly been hard to find someone who is a fan of both the Milwaukee Brewers and the Green Bay Packers. It is considerably harder to find someone who wore the uniforms of both clubs. 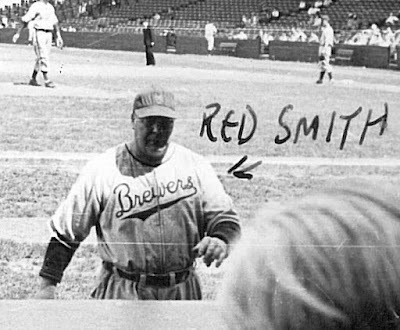 Richard Paul "Red" Smith was one of those men. 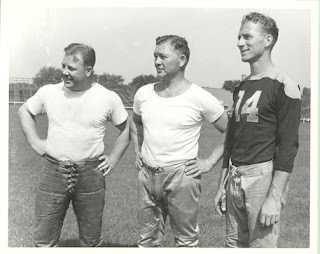 A native of the village of Brokaw in Northern Wisconsin, Smith went to Notre Dame, where he played football for Curly Lambeau's old coach Knute Rockne and captained the varsity baseball team. After graduation, he signed with the New York Giants baseball club, playing in their minor league system. 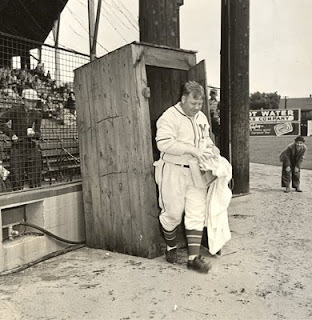 He got one game with the big club, in which he recorded a putout in the field but didn't get an official at-bat, before being sent back down to the minors. 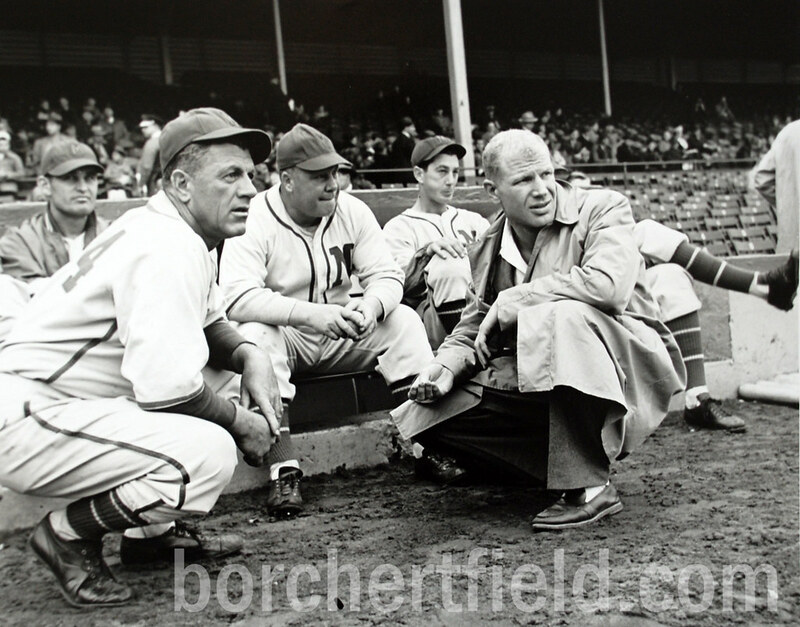 Okay, I have no idea what Red's doing here - what's with the outhouse structure at Borchert? Smith returned to the Brewers with Charlie Grimm in 1951, serving as the team's business manager, and when Grimm was called up to lead the Braves managed the Brewers himself for part of the 1952 season. When the Braves moved west the following year, bumping the Brewers to Toledo, Smith went with them. He retired from baseball in 1955 and returned to his home in Wisconsin. 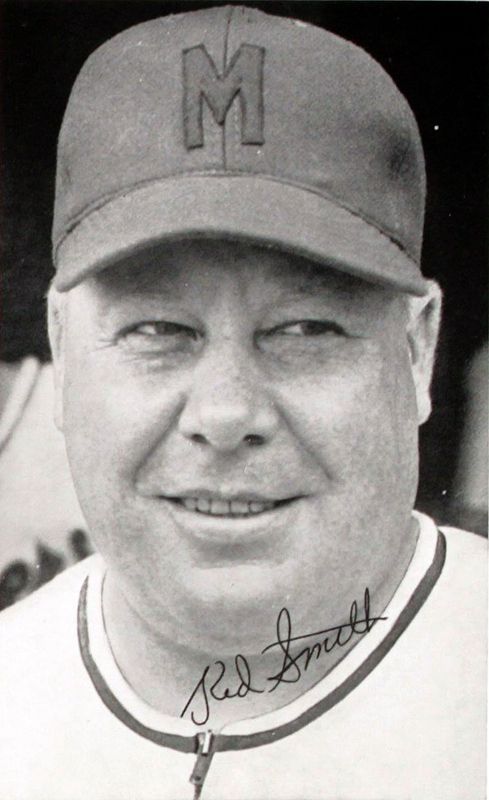 Smith died in 1978, but his name lives on in the annual Red Smith Sports Award Banquet, founded in 1965. It raises money for Wisconsin youth sports programs and scholarships.